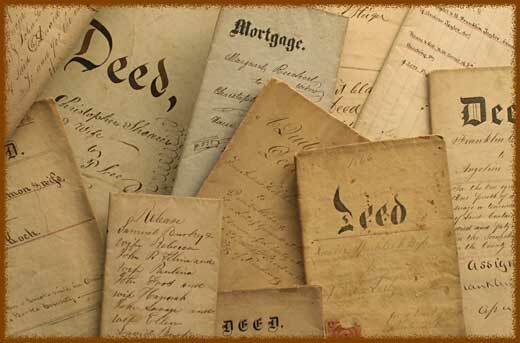 On March 4, 1871, Peter S. Anderson conveyed to his daughter Alice A. Deck described land in Whitfield County, "intending to convey to her only a life-estate, with remainder over to her children. Whether the deed does so convey said lots petitioners are informed there is doubt. Copy of said deed is hereto appended marked 'A' as an exhibit. Previously he had conveyed to another of his daughters, Laura F. Jackson in fee" described lands in Walker County, including the tract here involved, which deed "conveys the fee of such parts of said lots as said Peter S. then owned. The deed is hereto appended as exhibit 'B.' Afterwards . . . the said two daughters of said Peter S. Anderson, with his consent and approval, swapped their respective lands, said Alice A. conveying the said two Whitfield County lots to said Laura F. Jackson in fee, and the said Laura F. conveying the said Walker County lots to said Alice A. making a life-estate to her, with remainder over to her children, intending that all the children of said Alice A. born and to be born should share in said remainder interest. This was in accordance with the wishes of said Peter S.
"Petitioners say that the said Walker County lands are much more valuable than the Whitfield County lands, say by seven hundred dollars. A railroad has since been constructed through the said Walker County lands, rendering them still more valuable. On said lots 59 and 60 . . . along said railroad there are sites suitable for school buildings, stores, and residences, and there is a demand for said sites, if the title could be relieved from said remainder interest. The sale of a portion of said lot would make the residue of that lot and said lot 60 much more valuable than it will otherwise be, and a portion of the proceeds of said sales equal to the present value of the remainder in the portion so sold would be invested in improvements on the portion not sold, so as to greatly enhance the value of the said remaining portions . . .
"The portion of said lot 59 which could be sold as before stated is the south half of said lot, and that on lot 60 is about one acre lying south of the public road known as the Cove Road. The children of said Alice A. are all minors, and their names are Ida B. Wellborn, aged 17 years, Peter S., Willie, George D., Nettie, and Mable Deck, all under 14 years old. "Petitioners pray that these children and said Laura F. Jackson be made parties to this proceeding, and that a guardian or guardians ad litem for said minors be appointed by the court to represent their interests. They pray that the deed from petitioner to said Alice A., conveying to her the Whitfield County lands, and the deed from Alice A. to Laura F. be so reformed, if necessary, as to create a fee-simple title to said lands in said Laura F. And that the deed from Laura F. Jackson to Alice A. Deck, conveying the Walker County lands aforesaid, be so reformed as to create a life-estate to all said lands in said Alice A., with remainder to her children and their representatives if any be dead at the termination of the life-estate, except to the south half of lot 59 and all of lot 60 south of the Cove Road, and that the titles to the last two named parts of lots vest absolutely in said Alice A. Deck; and that said trade be ratified and confirmed."